Chris Gayle's 100th Test match for West Indies ended in defeat as debutant off spinner Mark Craig took 4-97 to seal New Zealand's win within four days. 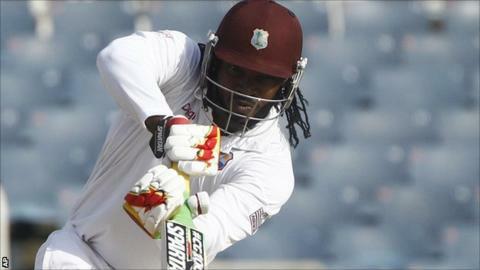 West Indies, set an improbable 403 to win, were bowled out for 216 with just two balls remaining in the day. Leg-spinner Ish Sodhi claimed 3-42 to help secure victory by 186 runs as Gayle became the eighth West Indian to pass 7,000 Test runs, but fell for 10. The second Test in the three-match series begins in Trinidad on Monday. "I'm on top of the world and pretty speechless right now," said Craig. "There was a lot of turn out there. It was a lot of fun. To get the win was very special. "This is a dream come true. It surely doesn't get any better than this." West Indies captain Denesh Ramdin added: "It all went wrong for us in the first innings when three of our top six didn't get a score. We need to spend more time at the crease."